“A new breed of vendors offers pulse survey tools, employee sentiment management tools, culture assessment tools, and real-time employee monitoring to help leaders and supervisors rapidly assess when engagement is high,” wrote the Deloitte researchers. Mobile connectivity and engagement are colliding with two other important shifts: the rise of Millennials in the workforce and the growing importance of environmental initiatives. 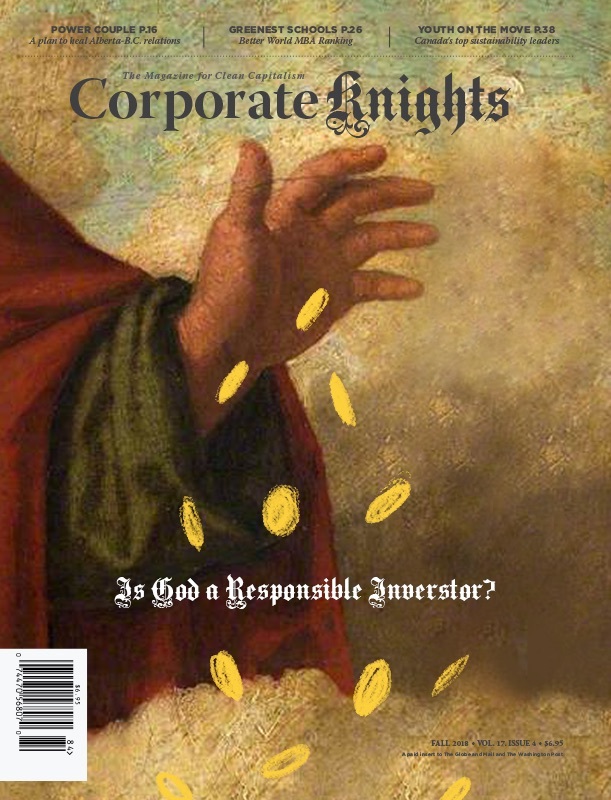 These factors are creating a “megatrend” for sustainability in the corporate world. And into that world steps Nudge Rewards. Nudge Rewards is a Toronto-based startup with an app that allows corporate customers to drive employee engagement via mobile channels. Companies can set up any kind of action and education campaign, but sustainability is a core focus for Nudge’s early clients. The premise is simple: employees download the app and management sends out surveys to judge awareness about issues, create contests, and develop rewards programs to encourage participation. Through back-end analysis, Nudge learns when employees are likely to respond to messages and categorizes different types of respondents. Across a few early large customers, results have been strong. 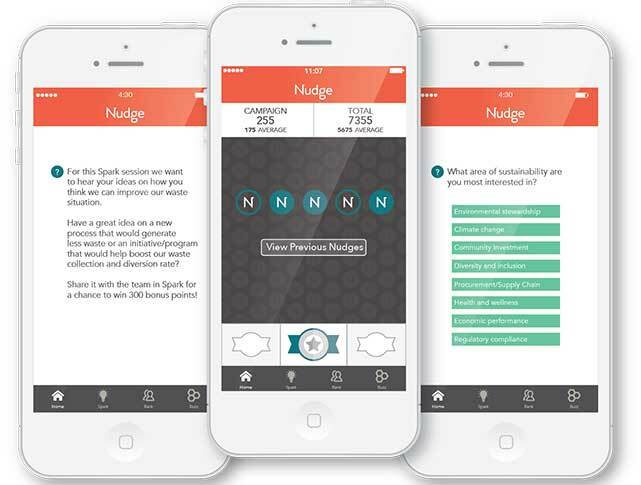 Close to 85 per cent of every single piece of information accessed through the Nudge app has been read – a big increase from the 25 per cent average response rate through traditional emails. “It was an ‘aha’ moment to see how much better this type of system is over the prehistoric ways of communicating,” said Lindsey Goodchild, the co-founder and chief executive of Nudge. Goodchild worked as a corporate consultant from 2009 to 2011 while getting her post-graduate certificate in sustainability at Ryerson University. As late as 2011, she noticed the lack of tools available for improving communications between employers and employees – a major problem as corporate environmental programs ramped up. Nudge’s most prominent user is Telus, Canada’s second-biggest telecom firm – a company that is dealing with the sustainability megatrend in a very real way. Telus has more than 43,000 employees, and over half of them are Millennials. Meanwhile, it has a goal of reducing energy use 10 per cent by the end of the decade. Seeing a unique opportunity to engage its young workforce, the company has ramped up efforts to build “ambassadors” to promote smarter energy use. In a recent eight-week pilot with Nudge, Telus saw between 73 per cent and 95 per cent of employees participating in education programs around environmental issues. The company now plans to expand its pilot from hundreds of employees to many thousands. Dix called the app “cool and sleek” – something that attracted younger workers. Nudge is off to a good start. But it’s entering a crowded space. Today, there are endless apps for sustainability. Gamification – the use of games to encourage behaviour change – has exploded in popularity. However, Goodchild thinks the company can gain an edge by proving strong results for large clients. “We know not everyone is going to be passionate about sustainability. But by engaging through simplicity in places where employees already are, we’ve already shown that we can broaden the appeal,” said Goodchild.